This is my scratch project, that is a remix of a fairytale. The project is based on the story, The Frog Prince, by the brothers grimm. 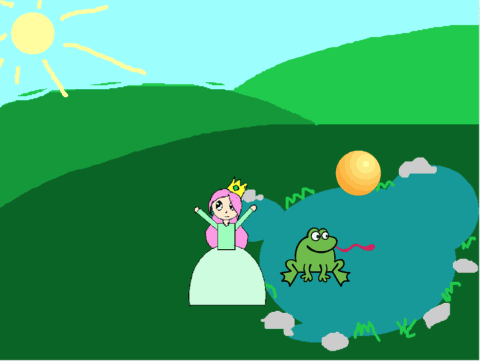 In the story, a princess drops her ball that she was playing with into a pond. A frog decided to make a deal with the princess, where in exchange for the frog retrieving that ball for her, the princess had to take care of the frog. Although the princess did not want to, she ended up taking care of the frog. Later, when the princess got annoyed by the from, she threw him into a wall and the frog turned into a prince. The princess and prince married, and lived happily ever after. My alternate ending for this story was the princess not keeping her promise, so she did not get to live happily ever after. To complete this project, first, I made a summary of the project. Then, I did a script that included all the dialogue and actions that the sprites do. After the script, I made 2 storyboards, for the 2 acts of the story. This helped me picture what the animation would look like better finally, I began my project with the work spread out into a couple of days. When I finished, I shared the project on the scratch website, and it was done. The Frog Prince Remix by Ruotong L. is licensed under a Creative Commons Attribution-ShareAlike 4.0 International License.